I was first introduced to Kim Thúy's work earlier this year when I took it upon myself to read each of the Canada Reads 2015 finalists. After a week of intense debates, Ru was crowned the 2015 Canada Reads champion. 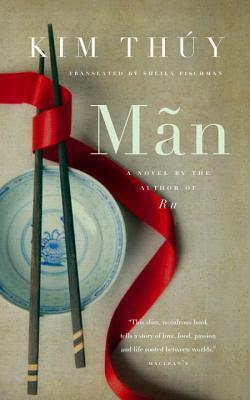 Kim Thúy was a gracious winner and truly deserved it as the story of Ru did break all barriers. I was excited when I was given the opportunity to read and review her latest book Mãn. Similar to Ru, Mãn is beautifully written. Thúy's lyrical style of writing takes some getting used to but after a few pages, readers will be able to easily follow along. The book is a collection of vignettes following Mãn's life from Vietnam to Canada. The book focuses heavily on food and its ability to evoke memories and seduce lovers. It was a book I read in a few hours and had a hard time putting down. Mãn was the perfect book to get me back into the blogging groove. It was a quick read with a story I couldn't help but love. Readers who adored Ru will enjoy Mãn. They are quite similar in writing style and it gives readers a different view of the struggles in finding your place in a new world. Mãn is also a must read for foodies, there are so many amazing dishes described throughout the book that it's hard to not suppress the hunger pangs while trying to finish the book. Now that my stomach is once again rumbling, I have to ask... what's your favourite Vietnamese dish?